With Huawei continuing to improve the battery life of its flagship models with each new generation, Samsung’s decision to retain the same battery capacities in the Galaxy S7, Galaxy S8, and Galaxy S9 lineups has led to quite a bit of criticism over the years. However, with the Galaxy S10 series just around the corner, the South Korean giant appears determined to change this. 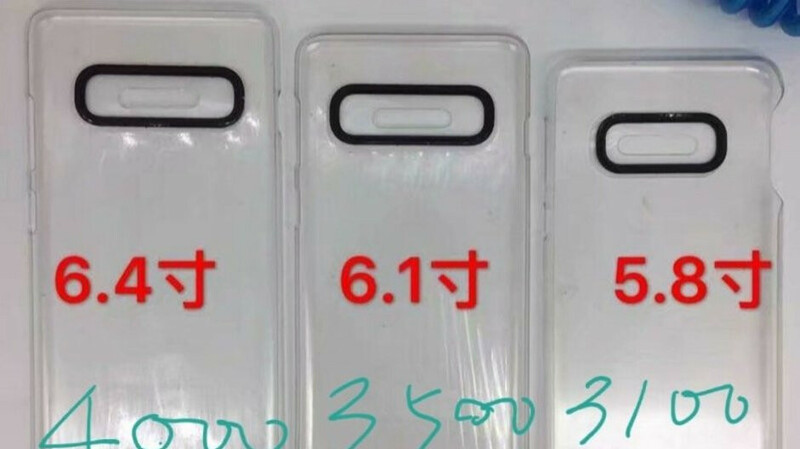 In a new leak courtesy of tipster Ice Universe, it has been revealed that the regular Galaxy S10 will make its debut next month with a 3,500mAh battery inside. This is a considerable 500mAh jump over the 3,000mAh cell found in the inside of the Galaxy S9 and also matches the battery capacity of the larger Galaxy S9+. In addition to this model, the leak also points towards a 4,000mAh battery inside the larger Galaxy S10+. This coincides with the capacity first reported back in October and also represents a 500mAh gain over the outgoing model. In fact, it puts the smartphone on par with both the Galaxy Note 9 and the Huawei Mate 20. Lastly, as revealed earlier today, the battery capacity of the cheaper Galaxy S10 Lite is listed as 3,100mAh. Although many may consider this as a little low, it’s worth noting that the smartphone is actually slightly smaller than the Galaxy S9, which features a 3,000mAh battery. In addition to this, the new device will feature a much more efficient processor and a lower resolution display, two factors that should help battery life. The Galaxy S10 series is expected to make its debut at an Unpacked event on February 20. Those interested in any of the devices should be able to pre-order them immediately after the event before the start of shipments in early March. 4000 mah is sweet ! Finally in display ultrasonic fps , BIG battery , One ui , great cameras . S10 plus is shaping up to be a proper "Rockstar" device of 2019. I was expecting 3200 or 3300mah for the s10 lite and 3800mah for the s10 but since it's not yet official... Ok.
3,800mAh for the regular Galaxy S10 is quite unrealistic IMO. Even the Huawei P20 (which is slightly bigger than the S9) only features a 3,400mAh battery. Agreed. People want above average everything, but they're not okay with paying above average prices. Besides, we all know that optimization is key here. These batteries can go a long way if done properly. Too bad, Samsung hasn't learnt anything from their mistakes of the last two years. They are doing most of the things right with the S line (the camera, build quality, display and performance) except the battery. It seems like they're going to do the same mistake again in 2019. They've understood what to do with the Note line, but that one is way too expensive (1000€ is way too much to ask for a smartphone). Next year, Huawei Oppo Xiaomi and Nokia are going to take even more market share from Samsung and Apple. What are you talking about? The S10+ is going to be the same size as the Note 9 & it will have the same sized battery. Did you expect the smaller versions to come with a 4000mAh battery as well? You people need to calm your expectations. They're just unrealistic. LoL, people want a 5000mAh, Super AMOLED with 8k display, in-screen FP sensor, 40MP camera, IP over 9000 and stereo mega bass speakers for only $500. Not even chinese phones can do that. Slow down there, bro. If that battery's not at least 7500mAh, I'm not interested. And don't forget that I need 100% screen to body. But will they stick with the slower charging QC 2.0 or move to a fast charging platform. They'll stick to their own adaptive charging, as usual. hopefully not, there has been an article saying that Samsung is working on a new fast charging technology, lets just hope that it would be ready for the s10. Ao this will go against apple’s line up: Xr, Xs and Xs Max. Amazing! Another failure.